How do the world’s experts see the next 12-18 months? What macro trends are emerging? What levels of Confidence vs Disruption exist in the aftermath of the Financial Crisis? The Global Agenda Survey is an annual reflection of the thinking of over 1,500 global experts in over 80 topical categories – who come together in the world’s biggest brainstorm each year in the United Arab Emirates. They debate and synthesise the state of the world, how Global Issues are interconnected, and what can be done to address such large-scale leadership issues. From a data science perspective, the Council interconnections mapping supplied great insight into what activity we should co-ordinate between Councils. Global problems cross topic areas, and need solutions from actors and organisations in multiple knowledge domains. 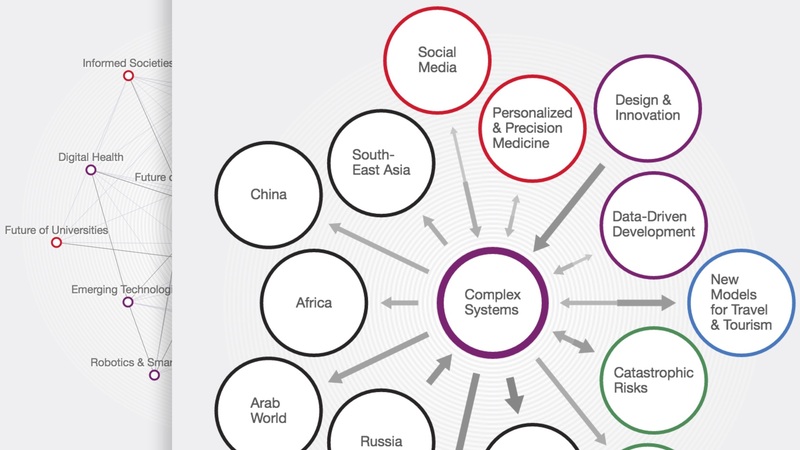 We identified clusters of issues, from Natural Resources and Human Development to New technologies for a better world. In many ways, this was an experiment in the growing opportunities around data visualisation, data analytics and data journalism. Whilst the Global Agenda Council team were responsible for surveying their members, the content product was unclear. So I defined the content strategy, led the concepts behind the product development, and sourced and managed the data visualisation team. I also challenged the team to interrogate the data, to find the underlying narratives that would convert into the stories that we found and wrote about. And we extracted key findings from the data set to support each trend. There were three key requirements I had for the data visualisation work. Firstly it needed to sit at the top of each page and act as the key visual as well as navigation – it’s possible to explore the 15 global trends and navigate to the pages to read about them. Secondly, it had to be up-to-date HTML 5 and run on any browser, including tablet devices. And third, it had to be socially shareable via an embed code. Within the Global Agenda Council team, we had a project manager and two people working on the data analysis and. Council members were chosen to write the articles for each identified Trend. Externally, a designer produced the look and feel of the charts and graphs, an external data visualisation agency coded the visuals and consulted on interaction, and a lead coder integrated the work into our digital-first Reports platform.